Maybe I’m noticing it more now that I’ve got one on my driveway, or perhaps it’s because they’re hard to miss, but there seem to be masses of C-HRs on the road. More than 9,300 by the end of August, according to Toyota’s own stats. That’s only a few hundred behind the Auris. The C-HR has quickly found fans in the UK. I’m pleased to see it’s hit the ground running; I spent a week with one in January and came away impressed. It’s the convergence of Toyota’s efforts to offer more appealing designs, a better drive, and a hybrid system that can go head to head with a diesel engine. That’s struck a chord with consumers; around 70% of sales so far are hybrids, though with a 135g/km petrol engine as the only alternative, that’s perhaps not surprising. Electrification might hike up the on-the-road costs, but at 87g/km it’s a no-brainer for fleets in this case. 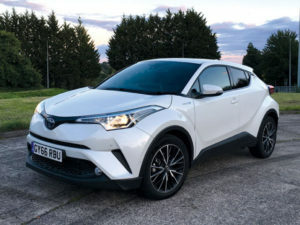 I’ve got six months to find out whether those good first impressions last; whether the hybrid system stacks up on long drives, how well that athletic styling stands up as an alternative to a hatchback, and whether it can live up to its near £29,000 price tag in Excel spec, complete with £1,595 premium pack.